My parents were fortunate to be cared for at home during their later years in life. Much of their care was provided by my sister, Cindy. For a period of ten years prior to their deaths, my parents had multiple physicians, each specializing in a particular system. Mom and Dad were veterans of health care facilities in their area, going from hospital to skilled nursing facilities/rehabs, and back to their home. They both experienced a number of care transitions and in-home support services. One of the reasons for my parent’s long lives was remarkable continuity of care and the documentation utilized through their Personal Health Records. Such continuity is unlikely without a shared patient record, good documentation and thorough communication with health care providers. My sisters and I were active participants in our parent’s care but my sister Cindy was at their bedside. She personally coordinated physician visits, maintained hygiene and planned out their required diets. Cindy provided them with medication management and she even invented a medication recognition guide to help her dispense their daily meds correctly. She frequently communicated health status and changes to other care providers that were in the home. We knew that good medical record keeping was especially vital as our parents health deteriorated and their care became more complex. Their Personal Health Record was an essential reference of information for diagnoses past and present, medications and allergic reactions, treatments and tests ordered and carried out and hospitalizations and surgeries. This also included insurance information and payments to providers. The Personal Health Record is not the same as your medical record which is recorded by your health care providers. The Personal Health Record is recorded and maintained by you. When Cindy needed to obtain in home help and utilize private duty services or home health care for our parents, the thorough Personal Health record keeping she had completed was a tremendous support to the ancillary care team. She was complimented many times by health care providers on her organization, management, and documentation of our parents care. During physician’s appointments, Cindy reviewed the medications and other medical information with the new specialists and conferred with my sister Carolyn and I whenever a change in medication, dosage, or treatments was recommended. This record keeping helped achieve interdisciplinary care for our parents. Interdisciplinary care that was provided by many types of practitioners, including physicians, nurses, pharmacists, therapists, social workers, and private duty staff and home health. 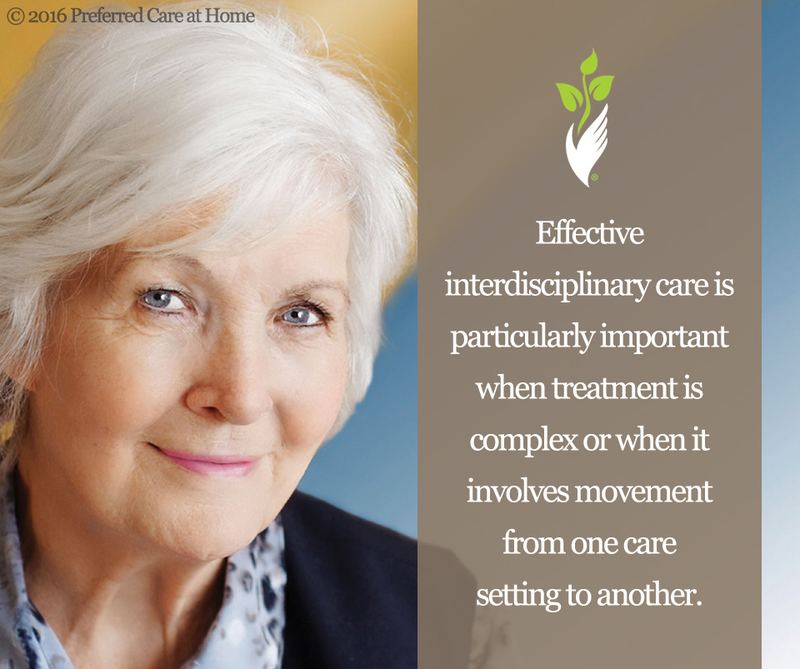 Effective interdisciplinary care is particularly important when treatment is complex or when it involves movement from one care setting to another. Medical error is a common reason for death in an inpatient facility but can be reduced when thorough, accurate record keeping is at hand. You should always update and have access to your personal health record. Information in your record should be accurate, reliable, and complete with additions for any changes in the health care plan. You should be in control of how your health information is accessed, used, and disclosed. Information such as medications, lab values, and surgeries or treatments should be included in the data. Contact information for physicians and other health care providers should be provided in the documentation. The above list is just a few of the recommendations for record keeping. Preferred Care at Home provides a free Personal Health Record to help you get started. This record is a 15-piece tool kit that includes everything you will need to keep in order all the moving parts of your loved one’s care.